More than 750 students from Yeshiva University’s undergraduate schools were presented with their degrees at YU’s 81st commencement exercises, held at the Izod Center in East Rutherford, NJ on May 24. Ten received the distinction of valedictorian, an honor that reflects their exceptional academic achievement. Valedictorians (L-R): Elana Sand, Chana Zuckier, Jennifer Lazaros, Yair Saperstein, Gregory Kupsin, Yehuda Safier, Anosh Moshe Zaghi, Avi Libman and Jesse Bernstein. Not pictured: Sultana Shoshani. 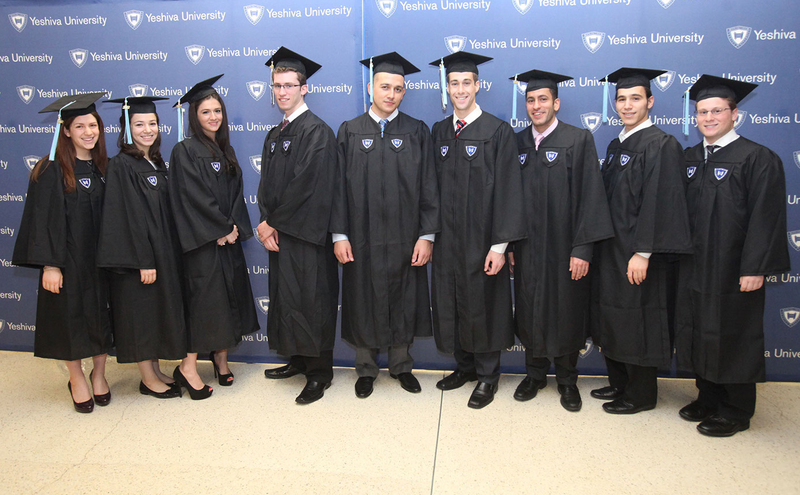 As the new graduates prepared to take their drive, creativity and dedication to a range of exciting careers and challenges, from medical school and finance to academic law and communal leadership, they recalled the close relationships with faculty, vibrant Jewish life and rich academic and extracurricular experiences that shaped their undergraduate years at Yeshiva. “YU taught me to take advantage of any opportunity,” said Yeshiva College Valedictorian Yair Saperstein, of Lawrence, NY. As a chemistry major, Saperstein founded Project START! Science, an independently-run initiative that sends 150 YU students to public schools in nearby Washington Heights to teach science. He will attend medical school next year. Chana Zuckier, valedictorian of Stern College for Women’s Rebecca Ivry Department of Jewish Studies, will continue to pursue her passion as a master’s candidate in both the Biblical and Talmudic Interpretation and Jewish Philosophy programs at YU’s Bernard Revel Graduate School for Jewish Studies before moving on to a career in academic law. As an undergraduate, the Monsey, NY native was editor-in-chief of Kol Hamevasar, the Jewish thought magazine of Yeshiva University’s student body. Other valedictorians include Jesse Bernstein (New Rochelle, NY), Isaac Breuer College; Jennifer Lazaros (Woodmere, NY), Stern College for Women; Avi Libman (Toronto, ON), Yeshiva Program/Mazer School of Talmudic Studies; and Yehuda Safier (Teaneck, NJ), Irving I. Stone Beit Midrash Program. I just want to tell you that I am very new to weblog and honestly liked you’re blog. Very likely I’m going to bookmark your blog post . You certainly come with beneficial articles and reviews. Thanks a bunch for sharing with us your webpage. I just want to say I’m all new to blogging and honestly enjoyed you’re web site. Very likely I’m going to bookmark your site . You certainly have outstanding stories. Thanks a bunch for sharing with us your website. I just want to say I am just very new to blogging and definitely savored you’re web page. More than likely I’m planning to bookmark your blog post . You certainly have excellent articles and reviews. Thank you for sharing with us your webpage. I just want to mention I’m newbie to blogs and truly enjoyed your website. Likely I’m going to bookmark your blog post . You absolutely come with great articles and reviews. Bless you for revealing your web page. I simply want to say I’m new to blogs and truly loved your blog. Probably I’m going to bookmark your blog . You really come with tremendous articles. Bless you for sharing with us your web-site. I simply want to say I’m all new to weblog and honestly liked you’re web site. Almost certainly I’m want to bookmark your website . You absolutely have impressive well written articles. Appreciate it for sharing your web page. I just want to say I am just new to weblog and certainly savored your web page. Most likely I’m likely to bookmark your blog post . You definitely come with amazing stories. Cheers for sharing your website page. I simply want to tell you that I’m newbie to blogging and site-building and truly enjoyed this page. Very likely I’m want to bookmark your blog . You certainly have remarkable stories. Cheers for sharing your blog site. I simply want to mention I am just new to weblog and seriously liked your web blog. Most likely I’m likely to bookmark your site . You actually have fantastic stories. Kudos for sharing with us your web site. I simply want to tell you that I am all new to blogging and site-building and truly enjoyed this web page. Most likely I’m planning to bookmark your site . You definitely come with fabulous writings. With thanks for sharing your blog. I just want to say I am just beginner to blogs and seriously enjoyed you’re web blog. More than likely I’m going to bookmark your blog post . You definitely come with outstanding well written articles. Appreciate it for revealing your web site. I simply want to mention I am very new to weblog and definitely loved your page. Probably I’m planning to bookmark your blog . You surely have tremendous posts. Cheers for sharing with us your web site. I just want to say I am just beginner to blogging and site-building and seriously loved your page. Very likely I’m going to bookmark your site . You amazingly come with amazing stories. Kudos for sharing with us your website. I simply want to mention I am just beginner to blogging and truly savored your page. Probably I’m likely to bookmark your blog post . You actually come with amazing articles and reviews. Bless you for sharing your blog.